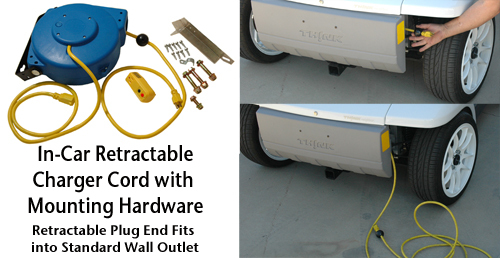 This is a spring retracted charger power cord kit made for this vehicle that travels with you. This is a big time saver when you are looking for a charge! It installs inside your Ford Think electric car so that you can plug in anywhere there is an 110v outlet. Installation takes about 30 minutes. It mounts under your front access panel and plugs into your charger. The end that pulls out and retracts is the end that you plug into the wall outlet. Just pull cord out and plug into your power source (about 23 feet of usable cord). When finished, it retracts back into its housing. Comes with instructions and hardware. Now I can pull up to the clubhouse and plug in my charger while I eat a sandwich.